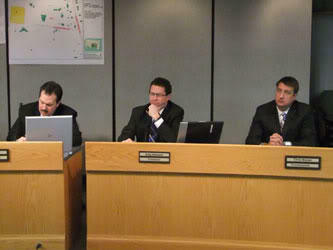 From left: Commissioners Portune, Hartmann and Monzel. Hamilton County Commissioners took a routine action during their weekly staff meeting Monday. But the Board is upset at just how routine this particular action has become. Each year the County Commission sets a budget. And at the end of each year, a supplemental budget transfer is made to cover various overages or mid-year adjustments. This year that number was nearly $7 million dollars just for new hires and employee raises. That has commissioners upset, and asking what the point of setting a budget is if no one follows it. "I think what we're seeing... is budget anarchy," says Todd Portune. The county administrator points out the budget is still structurally balanced. But Board President Greg Hartmann says it's time to draw the line and crack down on departmental overspending. "A budget is like a hand grenade, it gets in the general neighborhood," he says. "But these kind of numbers are not even in the same neighborhood when you talk about this wide of a disparity. If we have this kind of number again next year... it's not sustainable." The Sheriff's Department and the County Prosecutor were the top two offices to exceed their budgets. Commissioners noted it isn't fair to other county departments that 'play by the rules' when it comes to requesting funds for raises or other needs rather than simply spending the money and asking for help later. For example, Hartmann praises County Coroner Lakshmi Sammarco for being good about talking to the Board about her department's needs. "She does it the right way," he says. Speaking of the Coroner's Office. The Board says it is united in finding a solution to that department's space needs. Previous efforts have fallen through for various reasons. However, all three commissioners say they're focused on the issue as they hammer out the 2016 general fund budget. Negotiations are ongoing about identifying and paying for a new or remodeled space. Sammarco says there are several possibilities on the table. The Hamilton County Board of Commissioners is currently deliberating the proposed 2016 General Fund Budget submitted by the county administrator. The budget funds the county's government services, including the Sheriff's Department, the Prosecutor's office and courts system.